Hospital environments create the first impression of the type of care that will be received within. Hospital patients and visitors should be greeted by a confidence inspiring atmosphere that is properly maintained and well-organized. Hospital signs are a key contributor to the overall impression the hospital facility conveys. 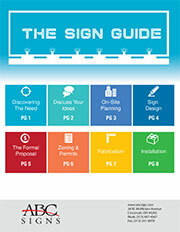 Effective hospital signage begins with a branded, uniform look, that leaves no ambiguity. Every sign on the hospital grounds and within the facility should be clear and instantly recognizable, to create an atmosphere of security and order. Hospital signs may be used to greet patrons, direct parking, advise location, and provide direction. Hospital departments are identified by signs and kiosk signs within the hospital are necessary to help patients and visitors find where they need to be. ADA signs in the hospital environment direct those in need of special accommodation. Hospital signs can also serve as promotional tools. Renovations, expansions, care enhancements, and equipment acquisitions can be spotlighted using attractive, attention-gaining signage. Hospitals may also use signs to honor benefactors or identify memorials. Whatever your hospital signs needs are, we can help. Contact us to discuss your signage needs!